Mars Society • The aspiring astronauts claim the site proves humans could be more effective than machines at probing the red planet. Al Hartmann | Tribune file photo The Hanksville-Burpee Dinosaur Quarry near Hanksville is offering free public tours starting Fr Scott Williams | Burpee Museum of Natural History Researchers work to uncover fossils in a dig site in southern Utah. 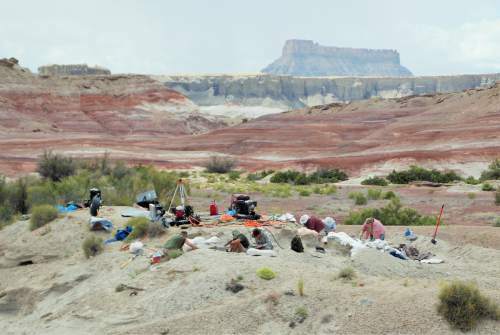 Scott Williams | Burpee Museum of Natural History Researchers work to uncover fossils in a dig site in southern Utah. Scott Williams | Courtesy of the Burpee Museum of Natural History Researchers work to uncover fossils in a dig site in southern U Scott Williams | Courtesy of the Burpee Museum of Natural History Researchers work to uncover fossils in a dig site in southern U Scott Williams | Courtesy of the Burpee Museum of Natural History Researchers work to uncover fossils in a dig site in southern U Scott Williams | Burpee Museum of Natural History Researchers work to uncover fossils in a dig site in southern Utah. Al Hartmann | Tribune file photo The Hanksville-Burpee Dinosaur Quarry near Hanksville is offering free public tours starting Friday through Saturday, June 6, 2015. Scott Williams | Burpee Museum of Natural History Researchers work to uncover fossils in a dig site in southern Utah. 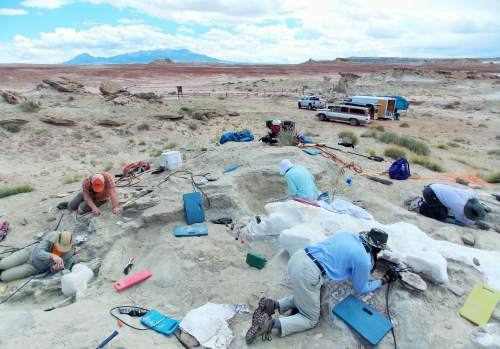 Scott Williams | Burpee Museum of Natural History Researchers work to uncover fossils in a dig site in southern Utah. Scott Williams | Courtesy of the Burpee Museum of Natural History Researchers work to uncover fossils in a dig site in southern Utah. Scott Williams | Courtesy of the Burpee Museum of Natural History Researchers work to uncover fossils in a dig site in southern Utah. Scott Williams | Courtesy of the Burpee Museum of Natural History Researchers work to uncover fossils in a dig site in southern Utah. Scott Williams | Burpee Museum of Natural History Researchers work to uncover fossils in a dig site in southern Utah. Would-be Mars explorers believe a Utah dinosaur quarry is proof their extraterrestial quest is worthy. A dinosaur fossil found 13 years ago in southern Utah has resulted in one of the largest fossil discoveries in history and highlights the importance of sending human explorers into space, according to The Mars Society. Scott Williams, director of science and exhibits for the Burpee Museum of Natural History in Rockford, Ill., said formal excavations in southern Utah started in 2008 after museum staff members were directed to the site by geologists with the U.S. Bureau of Land Management. The site, about 10 miles northwest of Hanksville, has been called a "bone jackpot." 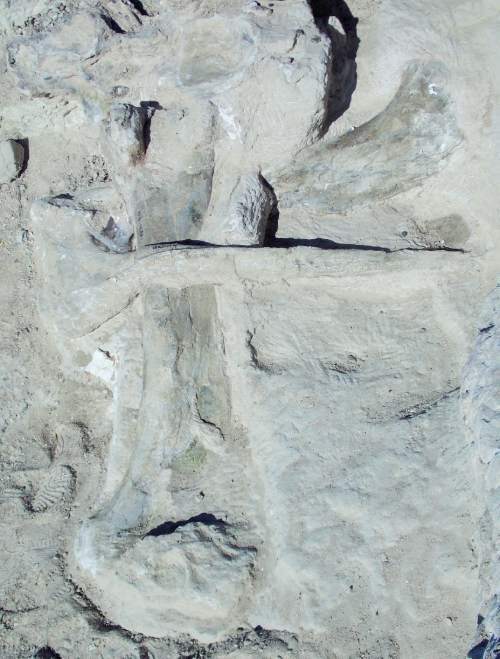 The fossil site extends for more than a quarter mile, Williams says, and is roughly the size and scope of the Dinosaur National Monument bonebed. 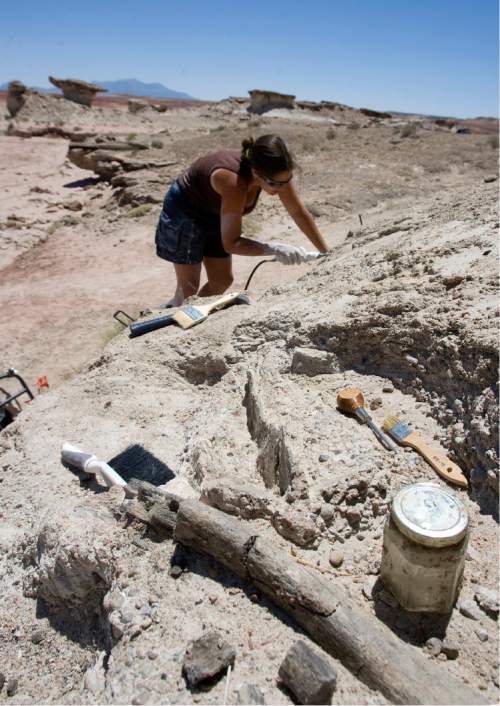 The Hanksville dig also was named a Top Ten Fossil Find in 2008 by National Geographic. "In a very short time, we found hundreds of dinosaur bones," Williams wrote in an email. "We have been working the quarry since." Mars Society President Robert Zubrin believes the Utah site proves humans could be more effective than machines at probing the red planet. The original Hanksville fossil was located during a 2002 simulation in which the southern Utah desert doubled for the surface of Mars. Unlike mechanical rovers deployed on Mars, Zubrin said, Mars Society team members were able to make spontaneous decisions and traverse difficult terrain. That resulted in the team locating endolith and dinosaur fossils. "You could have landed scores of rovers in that desert and never made either of those discoveries," he said. "Furthermore, now that professional paleontologists are on the scene, those finds are being followed up in a way that is light years beyond the capabilities of tele-operated rovers." Willaims said his team was unaware of The Mars Society&apos;s history with the site until about two weeks ago, when Zubrin visited the quarry during a public tour. Zubrin predicted the area, known as Lith Canyon, will continue to be explored and developed. In 20 or 30 years, he said, the Utah dig site could resemble the monument  with a visitor center, souvenir shop and cafeteria. He also suggested a similar process could follow the manned exploration of Mars if fossil remains of stromatolites or other simple organisms are located. "Then, the day will come when the place is turned into an exhibit," he said, "And Martian kids from New Plymouth will come out on classroom field trips to gawk at the displays in the visitor center of Stromatolite National Park, while some of the teenagers slink off to make out in the broom closet." BLM Utah spokeswoman Megan Crandall said there are no immediate plans to develop a visitor exhibit at the Hanksville-Burpee Quarry. But she added that public land managers are always exploring ideas to cultivate interest. "We&apos;re certainly not ready to break ground next year," she said. "But in the years ahead, who knows where it will take us?" • Free 45-minute tours offered at 11 a.m., 1 and 3 p.m. on a first-come, first-served basis. • For directions and other information about the site, call 435-542-3461 or visit: http://www.blm.gov/ut/st/en/prog/more/cultural/Paleontology/utah_paleontology/color_country_paleontology/hanksville-burpee.html.